When you order from Mansoura®, you can be assured we will ship your products with the utmost care. Every order is hand-packed to ensure that it arrives in perfect condition. All items are shipped from our location in Brooklyn, NY. We strive to ship orders the same day they are placed, but in some instances orders may require 2 business days to ship. FedEx Priority Overnight - Delivery the next business day by 10:30 am to most areas, or by 5:00 pm to remote areas. FedEx 2nd Day - Delivery in 2 business days by 4:30 pm to most areas, or by 8 pm to residences. FedEx Express Saver 3rd Day - Delivery in 3 business days by 4:30 pm to businesses, or by 8 pm to residences. This service is not available to Alaska and Hawaii. FedEx Home Delivery (Ground) - *Delivery in 1-5 business days within the contiguous U.S.; 5-7+ business days to Alaska and Hawaii. Please refer to the Ground shipping map below for approximate transit times. *Ground shipping times are not guaranteed, transit times may vary due to weather, national holidays, or other circumstances. For FedEx Priority Overnight, orders placed by 2:30 pm EST Monday through Thursday will ship the same day. Orders placed Friday through Sunday will ship the following Monday. For FedEx 2nd Day, orders placed by 2:30 pm EST Monday through Wednesday will ship the same day. Orders placed Thursday through Sunday will ship the following Monday. For FedEx Express Saver 3rd Day, orders placed by 2:30 pm EST Monday through Tuesday will ship the same day. Orders placed Wednesday through Sunday will ship the following Monday. For FedEx Home Delivery (ground), orders placed Monday through Friday by 2:30 pm EST will ship the same day. Orders placed after that will ship the following Monday. Please refer to our ground shipping map for transit times. Tranist times are not gauranteed, rural areas may reqire longer transit times. Please note: Delays may occur due to weather, availability or other unforeseen circumstances. We apologize for any inconvenience. We guarantee delivery only to the address you provide. Shipments to incorrect or incomplete addresses cannot be guaranteed to arrive on time. We do not deliver to P.O. Boxes or APO/FPO addresses. Please note that all perishable items are automatically shipped FedEx Priority Overnight to ensure that your product arrives in superb condition. All fresh and frozen food products are carefully packaged to maintain optimum quality. As needed, your order will be packed with dry ice or ice packs. We strongly suggest you choose FedEx Priority Overnight shipping when ordering chocolates during summer months to avoid melting. 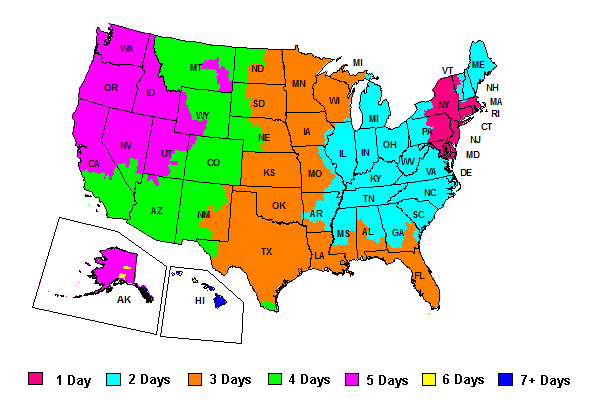 Please refer to our ground shipping map above for approximate transit times. n the unlikely event that your order has sustained damage during transit, please contact us for assistance. We will gladly assist you in filing a claim with FedEx. Refused packages packages are not an acceptable from of return. Any refused packages will not be refunded and will be charged for return shipping.